Order your Dupont Fire Head Cufflinks today from FahrneysPens.com. Fine Pens, Refills & Luxurious Gifts – great prices & fast shipping. The new Dupont Fire Head Collection - the Birth of a New Iconic Design, is a tribute to the universal symbol of fire. The triangle made of 6 triangular facets, this new pattern is velvety to the touch, contrasting superbly with geometrical precision of each motif. A new feat of craftsmanship using ancient techniques of guilloche and lacquer engraving is presented in the Fire Head Collection. 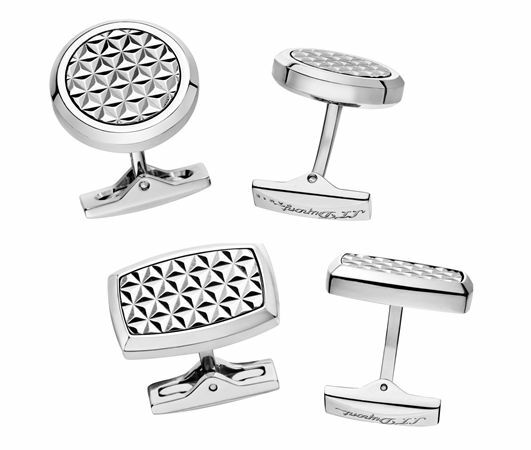 The Palladium-Plated Fire Head Cufflinks are available in both round and rectangle shape.